Your usual scarecrow is a pretty low tech contraption: A vaguely humanoid shape draped in old clothes on a field. But what would a high-tech scarecrow look like? A Dutch company has created 3D-printed robot birds of prey that can soar and swoop like the real thing, scaring away pesky real birds away from airports and fields. 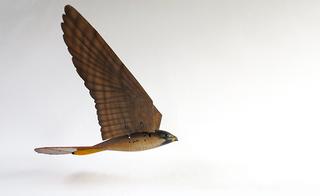 Clear Flight Solutions' "robirds" have foam wings and bodies made of 3D-printed nylon stretched over glass fiber composites. They mimic the silhouette and wing movement of a real bird of prey, which naturally scares smaller birds shitless. The team has prototyped a remote-controlled eagle and peregrine that you can see fly in the video below. It's definitely more realistic than say, other iterations of a bird-shaped robot with a retractable propeller—but the movement does still look uncannily stiff. Nevertheless, Clear Flight Solutions have been testing their remote-controlled robirds, and the results seem to be good. At waste management facilities where robirds have been deployed, the number of wild birds pecking at garbage has dropped by as much as 75 percent.